This may be happening due to improper VR Boom placement or cable management. Follow these tips for best results. The tip of the VR Boom should be about 3 feet above the player’s head. 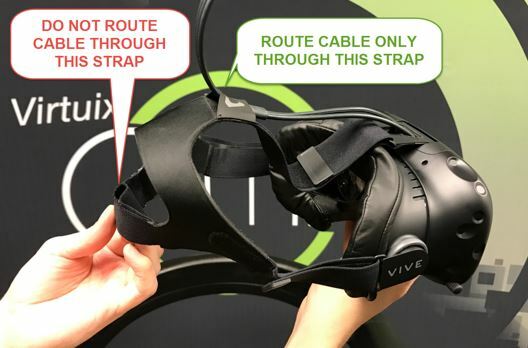 For Vive users, do not route the cable through the back strap, only the top strap. Make sure there is 20″ (50cm) of cable slack between the HMD and where the cable retractor attaches to the cable, and another 20” (50cm) between that point and where the cable is secured above the player’s head. The base of the VR Boom should be far enough away that the player’s arms do not hit the pole of the VR Boom while playing. IMPORTANT: When finished with a play session, unwind the HMD cable as it may have twisted during play. This will ensure smooth play for the next session.